The main premise of the book that, just as Christ is both fully divine and fully human, so should we look at Scripture in the same way. Thus, we are called to view the Scripture as incarnational. This can be a challenge to the somewhat docetic-like view that we can easily hold towards Scripture, seeing its divine nature trumping the reality that God used real human beings living in a specific culture and at a particular historical point to communicate His word. Finally, I shared some of Enns’ thoughts on how to approach the Old Testament as new covenant Christ-followers. As he says himself: ‘All this is to say that the central function of the Old Testament may not be there to “tell us what do do.” It may be more a part of a larger story that God brings to an end many hundreds of years later in Christ. And this story, which ends with the incarnation of God’s Son, had an incarnational dimension from the start.’ (p67) He actually comes onto this a little more in his fourth chapter, which I will point out below. And, I would suggest that we would also do well, at times, to apply this wisdom above to the rest of the Old Testament and the whole of Scripture. I don’t mean that we become choosers of what we obey and don’t obey. But it isn’t always as easy as quoting a particular verse of Scripture as a simple approach in applying Scripture to every situation we face in our life of faith. True, it would be much easier if it actually worked that way. But there is much more prudent wisdom in the understanding and application of Scripture. Of course, Scripture stands as our measuring stick for the beliefs we hold and practise of our faith. For me, that is a non-negotiable. But we are still called to utilise wisdom in our application of Scripture, whether in the Old or New Testament. The book, Inspiration and Incarnation, also gives time in exploring the theological diversity in places like the varying accounts reported in Samuel and Chronicles, as well as the diversity in the Law on particular matters such as how to treat slaves, how to celebrate the Passover, the offering of specified sacrifices, and its teaching on how to relate to the Gentiles. None of these should be seen as outright contradictions. But rather, when we read the text as is, there is diversity in the way the varying biblical authors communicated God’s word to His people. And we should expect such recognising the multiple hands across its pages within a particular culture and historical period as God brought about His progressive, redemptive revelation as summed up in Jesus Christ. Two final issues Enns address in the chapter are 1) the nature of multiple gods within the Scripture text and 2) whether God changes His mind. On the first, Enns conclusion is that it is most certain that an ancient near eastern people would have had a more polytheistic perspective. For us, as Christians living in today’s society, when we read the command that Israel was to have no other gods before Yahweh (Ex 20:3), we might say, ‘Of course, for there actually are no other gods.’ But the first commandment did not say, ‘There are no other gods,’ but that, ‘You shall have no other gods.’ So, from the ANE perspective, this could have easily been understood that Yahweh was calling His people to serve Him and Him alone, even in the midst of there being an abundance of other gods calling for their allegiance. In summary of his chapter 3, Enns proposes that allowing for the theological diversity in the Old Testament should be seen as a positive. These examples pointed out within the book are continual instances of God coming into the situation of those He created, stepping into their own culture and understanding as He progressively made Himself known throughout the tenor of Scripture. This is the beauty of the incarnational model – both Christ and Scripture come to us within a particular historical time frame, culture and worldview, honouring those as such while God makes Himself known to His frail and finite creatures whom He loves. In establishing an apostolic hermeneutic, Enns takes time to look at how other second temple literature utilised and interpreted the Old Testament, since the New Testament authors wrote within second temple Judaism. Tom Wright has also received much criticism for doing this in his approach to understanding Paul and justification. Our typical response to both Wright and Enns might be that God supersedes such normal cultural and historical approaches to communicate His word. But this is detrimental in understanding the word of God, which, again, came to use through a specific people group at a particular time in history. Jesus, as God’s Messiah, came to us as a circumcised, Jewish male under the law (Gal 4:4). Scripture, as God’s word, comes to us through an ancient near eastern people in the Old Testament text and a first century, second temple Jewish people in the New Testament text. We cannot deny this heritage of God’s word. Thus, our call is to understand how these people thought, how they lived, how they understood God and His revelation, etc. Jannes and Jambres in 2 Timothy 3:8 – These names do not come to us from the Old Testament text but from the second temple interpretative world. Noah as a ‘preacher of righteousness’ in 2 Peter 2:5 – Though this could possibly be inferred from the text in Genesis, it is more likely that it came from the Jewish interpretive tradition. The dispute over Moses’ body in Jude 9 – It is highly probable that Jude is not offering a new revelation that no one knew, rather it comes to us quite matter of factly because of this account being found amongst the second temple Jewish perspective. Jude 14-15 and its quotation of 1 Enoch – Jude probably did not have what we know as the pseudepigraphal book of 1 Enoch, but he was very likely referring to the traditions about Enoch that were very well known in his day. Moses’ Egyptian education in Acts 7:21-22 – Such is not found in the Old Testament text but would have been in second temple works like Philo’s Life of Moses. The Law put into effect through angels in Acts 7:52-53 (and possibly Heb 2:2-3) – Though many try and appeal to Deut 33:2-4 as the Old Testament text being referred to, the ‘holy ones’ are actually the Israelites. Again, this understanding would be found in second temple writings like that of Jubilees. Paul’s movable well in 1 Cor 10:1-4 – This is not specifically found in the text, but Paul was most likely referring to part of a well-known Jewish interpretive tradition. But, even more, there is a Christ-focus in this text, which I will come onto in just a moment. None of these examples call into question the text of Scripture. Rather, it shows 1) that referencing Jewish interpretive tradition for understanding the Old Testament text was not out of bounds for the writers of the New Testament, 2) we would do well to respect God’s revelation coming to us through a particular cultural and historical context and 3) it would do us good to have some knowledge of the second temple interpretive literature and tradition in understanding the way the New Testament functions. Of course, it is easy to note that this hermeneutic would flow out of his reformed background, with which I would agree. But even if one rejects the ecclesiotelic approach, one must appreciate the christotelic perspective, which underlines that Christ is the great fulfilment of the Old Testament – the Law, the Prophets and the Psalms (Luke 24:44). Not that we have to point to at least one specific passage in the Old Testament that connects to every statement and claim within the New Testament. But that, as a whole, the Scripture finds Christ as its great fulfilment and completion. I could definitely share more from the book, as if I haven’t already shared quite a lot in my two posts. 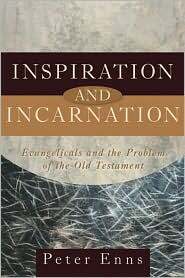 But, suffice it to say, I believe this book is a very insightful work on how to understand the difficulties of the Old Testament and how the New Testament writers understood and handled the heritage of the Hebrew text. And I sense Enns’ approach is done with grace and humility, rather than with a perspective to tear down or deconstruct the God-breathed, authoritative word of God. Is Enns incarnational model perfect? No, of course not. Each model, illustration or method that we utilise will have holes to pick in it. But I have walked away with a great appreciation for this book, gathering many helpful and wise insights on our approach to Scripture as new covenant Christ-followers. Therefore, I agree that Scripture is comes to us as an incarnational text, just as our Messiah and Lord came to us, meaning it finds its reliability and sustainability in our God who birthed such an inspired text, but birthed it through the vehicle of human beings within a particular cultural and historical tradition of their own day. This entry was tagged Bible, BioLogos, book reviews, books, critical scholarship, Peter Enns, science, Scripture. Bookmark the permalink.